Wise Men Will Seek Him Christmas Tract Pack of 25 reminds reader that today the wise among us seek the living Christ, as did the wise men of old. But even more, He seeks us. "Wise men still seek Him; and those who seek find more than they ever imagined. For in Jesus Christ, and Him alone, are to be found forgiveness, inward peace, joys in life today, the promises of life eternal." Length: 5.3" Width: 3.5" Height: 0.3"
Wise Men Still Seek Him Tracts - Pack Of 25 by Clyde H Dennis was published by Crossway in September 2005 and is our 16753rd best seller. The ISBN for Wise Men Still Seek Him Tracts - Pack Of 25 is 9781682162767. Be the first to review Wise Men Still Seek Him Tracts - Pack Of 25! Got a question? No problem! 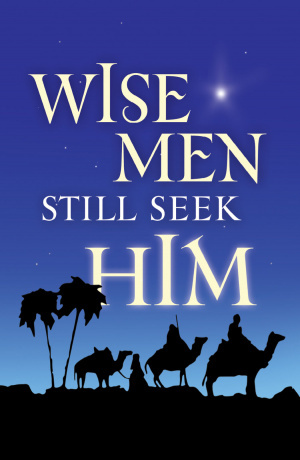 Just click here to ask us about Wise Men Still Seek Him Tracts - Pack Of 25.